The award-winning stories will be available on the competition website in the next few days. Sixty stories of a high calibre were entered for the competition this year presenting the judges with some fascinating reading and difficult deliberations. Guest judge, Jeni Williams, commented that the twists and wonderfully sustained metaphors of the winning story, ‘Sharp as Sherbert Lemons’, were terrific. This year’s judges were Jeni Williams, Robin Bloor, Amanda Miles and Tracey Warr. 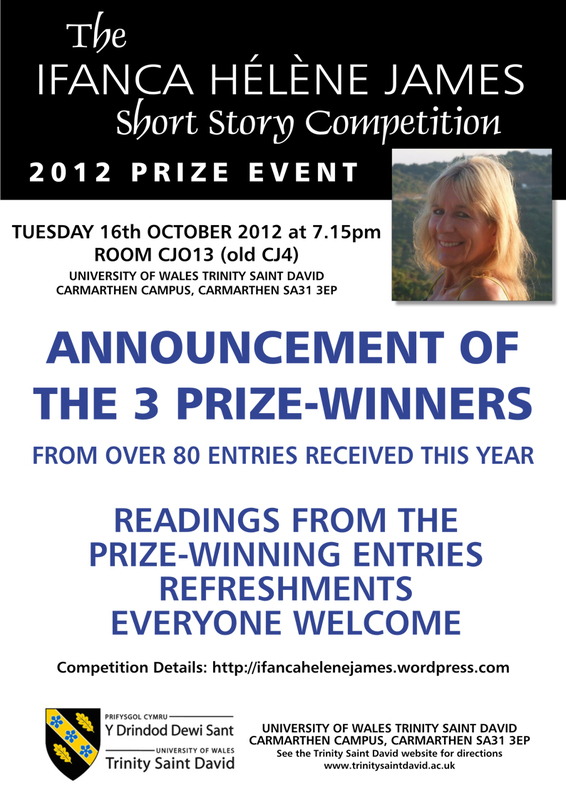 Ifanca Helene James Short Story Competition 2,200 words, first prize £100 and a bottle of champagne, entry fee £4, deadline 1st July 2015. There are just 38 days left to get your entries in for this year’s Ifanca Helene James Short Story Competition. Full details on how to enter and on previous winners are on this website. We look forward to reading your stories. The deadline for the 2015 Ifanca Helene James Competition is 1st July. Stories should be a maximum of 2,200 words. First prize is £100 and a bottle of champagne. This year’s judges are Jeni Williams, Senior Lecturer in Creative Writing at University of Wales Trinity St David’s, and published writers Tracey Warr, Robin Bloor and Amanda Miles. You can read the stories from previous winners on this website. See the entry-form1 and competition-rules for full details on how to enter. You can post your entry with a cheque for the £4 entry fee or you can email your entry to us and pay via Paypal using our email address. Diana Powell who recently won second prize in the Ifanca Helene James Short Story Competition has swiftly followed this up by winning first prize in the Penfro Book Festival Short Story Competition. The Ifanca Helene James Short Story Competition is now in its fifth year so we contacted the previous prize-winners to find out what they have been doing since winning the competition. Annia Lekka who won 2nd prize in the 2011 Competition for The Unfolding has written a short memoir entitled ‘Alice’ which will be published in Go World Travel Magazine Anthology this December. She has written four novels and is looking for an agent and publisher. You can read all the prize-winning stories at 2011 – 2013 Competitions and 2014 Competition. The winning stories will be posted on the website shortly. There was a very high standard of submissions this year and some difficult decisions for the judges. Thank you to all the writers who sent in stories. Copies of the winning stories will appear on this website shortly. We would like to thank all the writers who submitted this year. The work was of a very high standard and it proved to be a difficult selection. The deadline for next year’s competition is 1st July 2014. 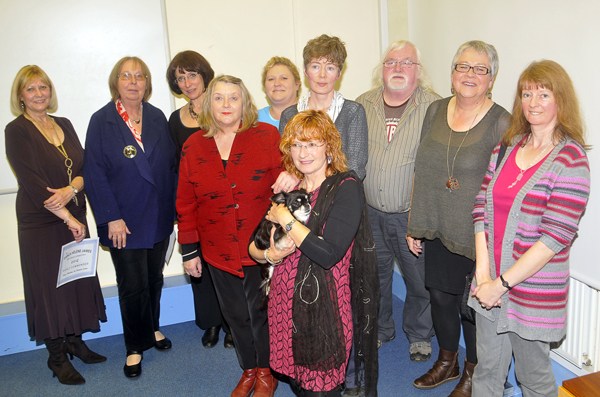 Some of the 2012 Prizewinners and Judges at the Prize-giving event at University of Wales Trinity Saint David in Carmarthen in October 2012.